Audience: TherapistsFunctional Hallux Limitis (FHL) is a decrease in the dorsiflexion of the big toe during gait. This limitation is assumed to be "functional" and is not structural. This means that simply pushing the big toe into dorsiflexion will not identify whether there is a functional problem. This lack of dorsiflexion of the 1st MTP joint can be associated with a lack of plantar flexion of the 1st metatarsal (i.e. 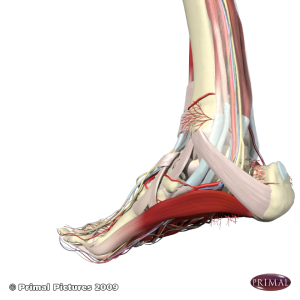 the 1st metatarsal may be hypermobile in that it translates/rotates dorsally) . Howard Dananberg has written and theorized extensively on the topic and I believe he is credited with postulating how limitation in big toe dorsiflexion can have negative effects right up the kinetic chain culminating in low back dysfunction. (editors note: the following of how FHL influences ground contact time is wrong - wow, I was taught this years ago and still hear it . Dr. Dananberg wrote to correct me. I have stroked out what my original comment was and italicized the corrected version. However, my inaccuracy does not change what theoretically happens at the hip which is what I was most interested in. His comment is below) Very simply, Dr. Dananberg suggests that a limited big toe dorsiflexion results in a too early toe off (because the foot can't stay on the ground long enough because of the lack dorsiflexion). This early toe . FHL may lead to a prolonged time to when the heel is raised off the ground. The prolonged ground contact may then leads to prolonged periods of flat foot. This abnormal function may lead to a decrease in hip extension which may cause the psoas and iliacus to actively fire to a greater degree than they would have had they been stretched with normal hip extension (i.e. a decrease in the elastic strain energy storage in the soft tissue structures anterior to the hip joint). I stress the use of the word "may" - While I greatly appreciate this theory and respect the thinking and work behind it I can't find any biomechanical work (e.g. a kinematic analysis correlating these altered kinematics to one another and the Fhl) to support it. THE PROBLEM - CAN WE IDENTIFY FHL? Whether a FHL is related to more proximal pathology can certainly be debated and part of debating and testing its influence on sagital plane dysfunction requires us to be able to identify FHL in our patients. Fortunately, Halstead and Raymond (JOSPT 2006) aimed to determine if there was a relationship between a static weightbearing assessment of 1st MTP dorsiflexion (the Hubscher test) and the amount of dorsiflexion that occurred during walking. The test had subjects stand on both feet while the experiment lifted up (dorsiflexed) their big toe to its maximal amount. Interestingly, they also did a similar test but in non-weight bearing where people were excluded from the study if their non-weightbearing dorsiflexion values were less than 50 degrees (i.e. they had a structural limitation of MTP dorsiflexion). The authors put subjects into two groups: the first group was limited in their static weightbearing dorsiflexion (about 19 degrees) and the control group had normal dorsiflexion during the static weight bearing test (about 39 degrees). Remember, both groups had full dorsiflexion when tested in non-weightbearing (about 55 degrees). Snap! No relationship. I am getting a little tired of the weakness of our clinical tests. The average dorsiflexion of the MTP during walking was about 36 degrees in both groups with a poor relationship between the static measure and the dynamic measure in the group that had lower MTP dorsiflexion values in the static test. "We consider the underlying assumptions required for inferring dynamic function from the Hubscher maneuver to be invalid, and we suggest that the term FHL can only be applied using an instrumented dynamic gait assessment to confirm first MTP joint limitation during walking. The data indicate that the Hubscher maneuver is an inappropriate basis for treatment decisions and cannot be considered valid as an outcome measure for other functional therapy"
1. There is still a paucity of research investigating how limits in big toe dorsiflexion influence sagital plane kinematics (toe off, knee angles, hip extension, spinal bend). This research is not difficult it just has not been done. 2. For manual therapists we don't know with certainty what structures are involved in FHL. Again, a simple study looking at sagital plane kinematics pre and post the treatment of different structures would provide a starting point. 3. With the 1st metatarsal hypermobility being linked with FHL us manual therapists may want to be judicious in how much we manipulate and mobilize. 4. Why do I keep reading/hearing that the 1st toe needs 65 degrees of dorsiflexion during gait. I think this is wrong as it appears to be more in line with 30-40 degrees. Nawoczenski (1999) supports this as does the study reviewed above. I would also hazard that more dorsiflexion is not required during running much as more hip extension is not seen during running when compared to walking.